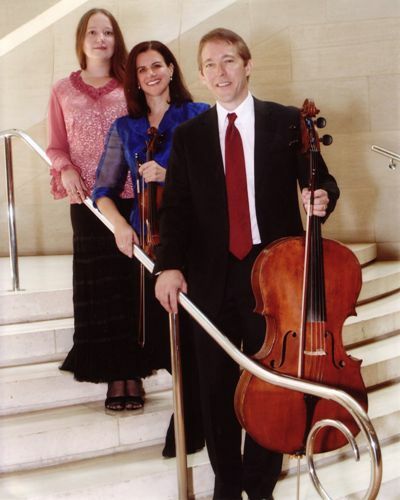 Fine Arts Chamber Players invites you to a FREE Bancroft Family Concert on Saturday, April 26, 2014 at 3:00pm featuring the Verlaine Trio at the Dallas Museum of Art’s Horchow Auditorium. The museum is located at 1717 North Harwood, Dallas, TX 75201. Admission to the museum and the concert is free with no reservations or tickets required. Auditorium doors open at 2:30pm for the 3:00pm concert. For more information, please call 214.520.2219 or visit www.fineartschamberplayers.org. Performing works by master composers, the Verlaine Trio features internationally acclaimed artists: Dallas Symphony violinist Maria Schleuning, Associate Principal Cellist Jolyon Pegis and Southern Methodist University piano faculty member Liudmila Georgievskaya. The program will open with Ludwig van Beethoven’s Variations in E flat Major, Op. 44. Composed by a 22-year-old Beethoven, this set of 14 variations precedes his Opus 1 piano trios. Next, the Verlaine Trio will play Joaquin Turina’s three-movement Trio No. 1 in D Major, Op. 35. Closing the program is Felix Mendelssohn’s Piano Trio No. 2 in C minor, Op. 66, written in 1845 and dedicated to German composer, conductor, and violinist Louis Spohr. Bancroft Family Concerts are made possible in part by the Sue & Christopher Bancroft Family, Brinker International, the City of Dallas Office of Cultural Affairs, TACA, the Texas Commission on the Arts, the National Endowment for the Arts, WRR-FM Classical 101, and Sloan Bergmann Commercial Print Services Company. For over 33 years, FACP has presented free classical music programs for the enrichment of North Texas residents. In addition to the free Bancroft Family Concerts, FACP presents the free Basically Beethoven Festival in July. Each year, FACP’s educational outreach programs, Dream Collectors, Music A-Z, and Music Residencies, provide over 500 free educational classes and performances in area public schools. Since its inception in 1981, FACP has served over 210,000 children and performed for over 530,000 residents of North Texas.